Haryana Chief Minister Bhupinder Singh Hooda on Sunday laid the foundation stone for the extension of metro rail from YMCA Chowk to Ballabhgarh in Faridabad. An amount of Rs.564 crore has been sanctioned for the project. The construction will be done by March 2017. Speaking on the occasion, Mr. Hooda said the project will provide an international-level travelling facility to the people of Delhi, Faridabad and Ballabgarh. Two new stations at NCB Colony and Ballabgarh will be set up on this metro line. The extension work of the Delhi Metro project from Badarpur to YMCA Chowk in Faridabad is in its final phase. Chowk as the spot for setting up a cloverleaf flyover. Officials also agreed to build a flyover or an underpass between Shankar Chowk and Iffco Chowk, while an underpass is likely to come up at Hero Honda Chowk. However, the officials of the stakeholder bodies are yet to thrash out the crucial cost-sharing issue. There has not been any meeting of minds on this issue so far. The said extension, that will be an extension of two lines, namely Dwarka Sector 21-Noida City Centre and the upcoming Noida-Noida Sector 62 stretch, will comprise 21 stations. The 30-km long elevated Noida-Greater Noida metro extension is likely to be thrown open by March 2017, months ahead of its deadline, Delhi Metro Rail Corporation chief Mangu Singh said today. Singh made the comments at an event to mark the installation of the first ‘U-girder’, horizontal segments on which metro tracks are laid on elevated sections, of this upcoming corridor. Singh expressed hope that in view of the “fast pace” of construction, it “should be possible” to open this section for the public a few months before the schedule. December 31 completion deadline — thanks to the lackadaisical attitude of the Haryana Urban Development Authority (Huda). The 150-metre-wide road will connect Dwarka in Delhi and Kherki Daula on NH-8. Of the 18-km stretch, the bituminous work is complete hardly on eight km area. Moreover, a four-km stretch is entangled in a legal dispute. "We still have 28 days and we hope to complete at least five km. I have asked the contractor to speed up the work and complete the stretch by end of the month," said Pankaj Kumra, chief engineer, Huda, the custodian authority of the project. The delay has shattered the dreams of tens of thousands of buyers and builders whose money is invested in hundreds of projects coming up along the NPR. The project was awarded to JSR Construction Pvt Ltd and Indiabulls Construction Limited on April 1, 2011 and its first deadline was March 31, 2012. Gurgaon to Chandigarh- by Shatabdi Express ! CHANDIGARH: If plans translate into action, you could soon be boarding a Shatabdi Express to Gurgaon. The extension of the popular train service to the Haryana city is on the cards, with railway officials considering the proposal. Apart from hundreds of techies and management professionals who shuttle between Chandigarh and Gurgaon for work, the added facility is likely to bring respite to those who don't have private conveyance and often have to take a cab from the New Delhi railway station, an exercise that is more cumbersome than the train ride itself. The residents of Gurgaon and Manesar have a news to cheer up. Soon Gurgaon expressway would have four new underpasses, 2 additional lanes at Kherki-Daula toll entry points (presently 10 toll points) and 18 additional toll entry points on Delhi-Gurgaon border toll plaza (presently 32 toll entry points). The four underpasses are proposed on expressway from Gurgaon to Bilaspur Chowk to make the commuting hassle free on this stretch. These include under pass at Narsinghpur, Kherkidaula, Anajmandi and Hero Honda Chowk. Built at a cost of Rs 340 crore, the Badarpur elevated road was supposed to be the one-stop solution to the traffic nightmare that motorists faced on the Delhi-Faridabad border. Yet, weeks after being inaugurated, the elevated corridor seems to have only thrown up a host of new problems. Traffic jams are still a common sight here, made worse along the multiple loops that come down from the elevated corridor towards Jaitpur, Mehruali and Badarpur village. Long lines of vehicles jostling to get around the loops are followed by the equally long queue near Aali Village, the last — or first, depending on the direction you’re coming from — junction before you get on the elevated corridor. Dedicated Freight Corridor is one project that can dramatically change industrial face of India and NCR region in particular. There is a positive news flow on Eastern Dedicated Freight Corridor as the World bank has issued Rs 10,800 crores loan for corridor. The corridor runs from Ludhiana to Bihar (to be extended to Kolkata) with a total length of 1280 km. Dadri would be the junction of Eastern and Western Dedicated Freight Corridor. 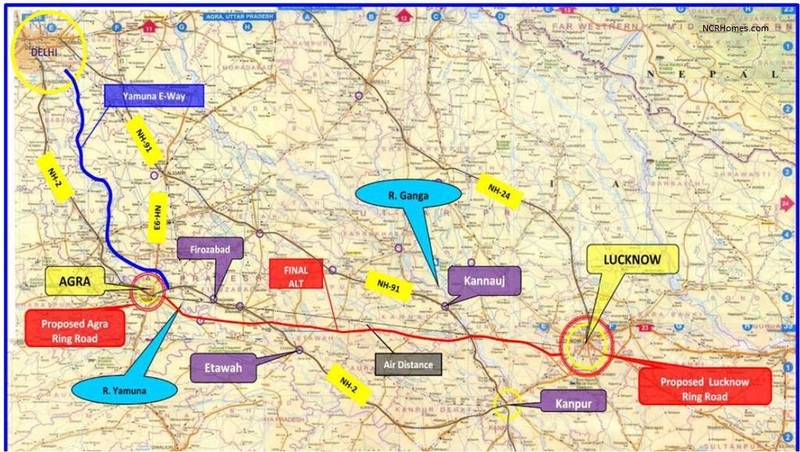 The more popular and dynamic Delhi-Mumbai Dedicated Freight Corridor would be 1483 km long between Dadri and Mumbai. An integrated transport report has been prepared for the NCR Planning Board keeping in mind the increasing volume of traffic in the area. The report has laid a road map for bypassing the traffic bottlenecks on the capital's periphery. Its prescription leads to 11 new expressways and two orbital railway corridors connecting major cities around Delhi. The connectivity plan is based on the study commissioned by the NCR planning board two years ago. The plan was approved in a board meeting recently. The board has decided to initiate action for priority implementation of a region-wide rail-based system connecting various metropolitan and regional centres and sub-regional centres. GURGAON: In a bid to get rid of encroachments on the Northern Peripheral Road (NPR) project, the HUDA has decided to allot alternative plots and compensation to all house owners as per the government rules. A high level committee had cleared the decks for the allotment of alternative plots for houses which come under the NPR project. The 150-metre wide NPR is proposed from Dwarka in Delhi to Kherki Daula on NH-8, through Gurgaon. The committee recommended allotment of plots in Mayfield Garden to the house owners who are willing to take alternative plots. The inauguration of the much- awaited Badarpur flyover on Monday has also paved the way for the Badarpur-Ashram elevated stretch. This was said by the Union minister for roads and highways, Kamal Nath at the formal inauguration of the Badarpur flyover on National Highway-II at Mehrauli Crossing near Badarpur on Monday afternoon.